One thing I love about working for a museum is having a lot of variety in the tasks and projects I work on. No two days are ever the same: There are always new exhibitions, new visitors, and new volunteers to engage. Don’t get me wrong, a lot of the projects I work on involve lots of meetings and paperwork, but it’s pretty darn good as a workplace goes. At Mia, we’re focusing on telling stories about people, because the objects in our galleries represent people. They were made by people for a reason, and understanding and exploring those reasons is key to understanding the objects, but perhaps more importantly, it’s key to understanding ourselves and each other. On these recent trips, I gained a greater appreciation of the people we met with as artists, individuals, and members of communities than I thought possible, as they described their artwork, process, and personal experiences. Those Mia folks included Jill Ahlberg Yohe, associate curator of Native American Art and co-curator of the exhibition; Dakota Hoska, research assistant; Elizabeth Day, Native American Fellow; Mike Dust, head of Interactive Media and Senior Producer; and Ryan Lee, media production lead. In Santa Fe, we were accompanied by Teri Greeves, an artist and co-curator of the exhibition. 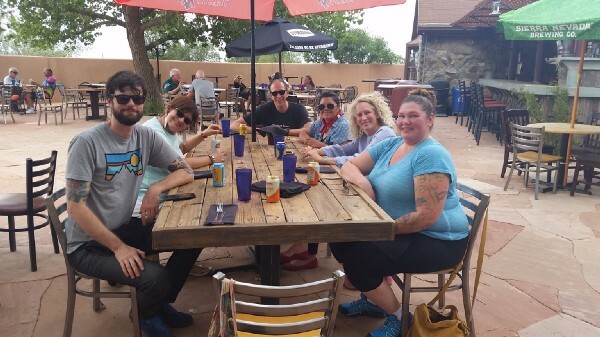 The Mia team on a break from filming in the Southwest. Clockwise from left: Ryan Lee, Dakota Hoska, Mike Dust, Teri Greeves, Jill Albergh Yohe, Elizabeth Day. The Mia team on a break from filming in the Southwest. Elizabeth, Mike, and Ryan recorded video of interviews that Teri, Jill, and Dakota led. I took detailed time-stamped notes and soaked up all I could to help share the content and experience with docents, guides, and visitors. We will use the video and audio in multiple ways. Our Interactive Media team—Mike Dust, Ryan Lee, Josie Lampone, and Elizabeth Day—will use the video footage to create trailers (like a movie trailer) to promote the exhibition. They will also create videos that help serve as transition and introduction pieces for each of the three themes of the show: legacy, power, and relationships. Daliya Jokondo (Mia’s Fellow in Learning Innovation) and I will use the audio from these interviews to create an audioguide to accompany the exhibition. The content from these interviews will inform the training that we provide to the volunteer guides and docents who will lead tours of the exhibition. Ryan Lee shooting in artist Cara Romero’s studio. One thing that Mia staff discussed on our trips were the commonalities and resonances that we heard and saw among these women and their work. Many of the artists discussed how they learned by watching older family members, and they noted the importance of understanding this history of making in their families and communities. Of course, there were differences, too. And it was enlightening to hear the artists respond in vastly different ways to similar questions. Several mentioned that people often ask them how long it takes to make an artwork. One artist explained that it’s not just the amount of time that she puts into creating an object, but the years of knowledge and experience that have been passed from generation to generation that allow her to even begin to make something. So, her answer has become, “1,000 years.” Another artist explained that she made a beaded bandolier while watching the entire series Frasier on Netflix. A panoramic view of the crew at work in the high desert. Not only did the trip offer great insights into the work and lives of the artists featured in the exhibition, it also allowed me a peek into the work of my colleagues at Mia that often goes unseen. Watching Mike, Ryan, and Elizabeth deftly set up lights, cameras, and monitors, and carefully frame shots, was a real lesson in all that goes into making Mia’s videos look as good as they do. There is also A LOT of heavy gear that has to be carted around to make the magic happen. I’m so excited for you to see and hear the products of these trips. The exhibition opens in summer 2019.